30% Unlimited Christmas Eve! On Sunday from 00:00GMT until 23:59 GMT, all members on their first deposit of just $/£/€30 or more will receive a 30% bonus up to 150.00 on every deposit made. 75% Merry Christmas! From 00:00GMT until 23:59 GMT, all members on their deposit of $/£/€30 or more will receive a 75% bonus up to $150.00 bonus. 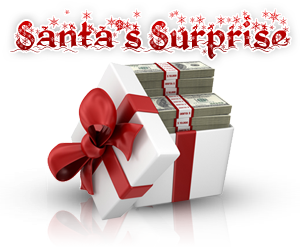 Plus, for every 10.00 deposited, you get 1 ticket into Santa’s Drawing! 115% BIG TUESDAY! From 00:00GMT until 23:59 GMT, all members are invited to receive a 115% bonus up to 115.00 on your first deposit of $/£/€ 30 or more.